Recent release “Rocket Propellant Technology” from Page Publishing author Jawaharlal “Ram” Ramnarace is a remarkable educational guide through the history and principles of rocketry. Jawaharlal “Ram” Ramnarace, a chemical engineer with over 30-years’ experience in the design, development, testing and production of gun and rocket propellants, gas generators, tracers, igniters, pyrotechnic devices, and illumination and decoy flares; researcher, scientist, educated writer and author, has completed his newest work “Rocket Propellant Technology”: a profound work that is the perfect read for the serious astronautic student. Published by New York City-based Page Publishing, Jawaharlal “Ram” Ramnarance’s intellectual work delves into the subjects of rocket history, types of propellants, chemical reactions, propellant development and space flight. Rocket Propulsion has come of age. Although its potentialities and capabilities in many areas have been recognized for centuries, it is only in recent years that scientists have had the materials and the manufacturing techniques at their command so they could control and direct the tremendous forces available. Space exploration and manned flights by astronauts have brought the science of rocketry to the attention of the general public. It has also stimulated the interest of students at all levels of advancement in the technical details of space flight. 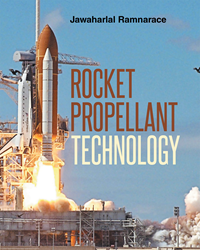 Rocket Propellant Technologies is written for serious students of astronautics. This volume reviews briefly the history of rocketry and the fundamental principles connected with rocket propulsion. Types of propellants, the chemical reactions involved, and the techniques used in manufacturing are explained. The merits of solid and liquid fuels are enumerated. Exotic propellants of the future are discussed, with reasons why their development is essential. Finally, the safety aspects of manufacturing and testing rocket propellants are given in detail. The Amateur Rocket Association under whose guidance this series has been prepared, serves as a focal point for many related activities, bringing new ideas to the attention of its members and offering suggestions for future lines of research. Readers who wish to experience this scientific work can purchase“Rocket Propellant Technology” at bookstores everywhere, or online at the Apple iTunes store, Amazon, Google Play or Barnes and Noble.